I recently spoke with the traders at SMB and shared a few best practices that had benefited my trading over the past several months. The idea is not that any traders should mimic my trading; rather, traders need to learn from their successes, identify what they are doing well, and then become more consistent in implementing those strengths. 1) My profitability has improved since I've focused on consistency rather than profitability. I've honed in on what are good trades for me and where my profits have come from. I just want to be consistent in trading those good trades. If I can do that, the profitability will come. And if I want greater profitability, I should size up the good trades, not take other, more marginal trades. 2) A corollary of the above is that my best trading has been highly selective trading. There are days and series of days when I don't place a trade. I'm fine with that. My aim is not to trade; my aim is to make money. 3) The amount of time I spend staring at screens is not correlated with my profitability. If you're a high frequency trader, you need to track each tick in the market. If you're not a high frequency trader and you're staring at each tick in the market, you're either lacking confidence in your trade or you're sized too large and taking too much risk. When I'm in a good trade, I can walk away for a while. 4) I've found my own way of making sense of markets. 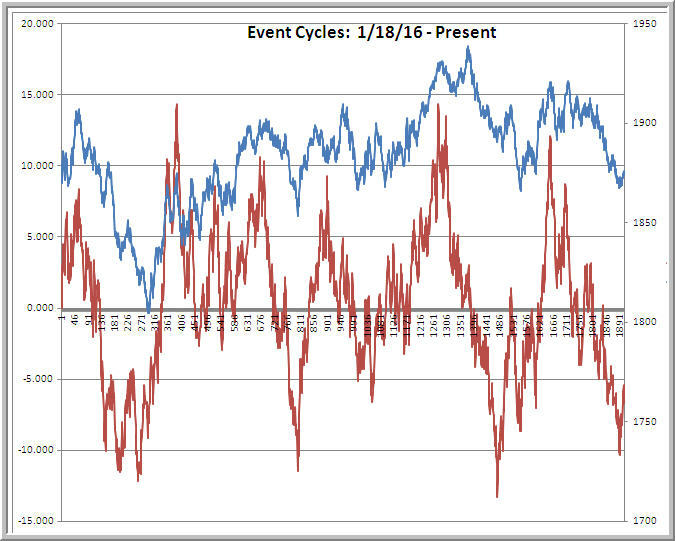 I think in terms of cycles, not trends. (See above). When I assess shorter-term cycles, it's over event time, not chronological time. When I look at volatility, it's by comparing the volatility priced into options versus the volatility recently realized in price action. All of these are ways of thinking about markets that I've studied and that make sense to me. I don't know how to have staying power in a trade if it's not an idea that makes deep sense. 5) I've studied the trajectory of my profitable and unprofitable trades. Many of the trades I enter will anticipate a market move following a period of compressed volatility. I generally anticipate the ramping up of volatility pretty well. If it ramps in the wrong direction, my trade goes wrong relatively quickly. By entering the trade with a small core position, I ensure that a losing trade won't be a large trade. If the volatility moves in my expected direction, I can use bounces against the move to add to the position. I don't add to losing trades and I'm quick to take profits opportunistically on added pieces of trades. Sound money management has been the best form of psychological management. 6) One of my best predictors of making money is having fun with markets. I have fun when I develop new tools, generate new ideas, and see them work in practice. If I focus too much on making money or not losing money, all the fun goes away from trading. That's when I'm likely to make bad decisions. If I'm having fun with markets, I don't need to trade. If I need to trade, I don't have fun with markets. 7) I'm best when I specialize. I trade one thing and one thing only, the ES futures. I study high frequency data on stocks (upticks/downticks, patterns of very short-term price and volume behavior); I study unusual measures of market breadth; I study cycles of various market sectors; etc. I don't trade different individual stocks and I don't trade other asset classes. My goal is to be a product specialist, not a trading generalist. That has helped greatly in my pattern recognition. If I were to look at different stocks and markets each day, I would not build up the database of patterns I would need to recognize opportunities. The big idea here is that getting to that next level of trading performance requires self-awareness. You need to know what you're good at, what speaks to you, and where your successes come from. You get to the next level, not by changing who you are, but by distilling the essence of who you are and becoming ever better in leveraging that.